Designed by Bruce Roberts and constructed by the previous owner, this sturdy steel flybridge motor cruiser was sailed down from North West Scotland in 2017 and has undergone a period of refurbishment and improvement. She is looking good, clean, tidy and ready for new ownership. Powered by a 250 Hp Mercruiser diesel engine (with only 256 engine hours), fitted with a 3.5KVA generator and backed up by bow and stern thrusters for ease when marina manoeuvring, this twin helmed vessel is impressive. Externally the decks are easy and safe to move around. The large aft deck has a hoist for the outboard and integrated steps leading to the swim platform that’s fitted with snap davits for a tender. The accommodation, with well over 6ft head room, is light, spacious, clean and tidy. The head linings have been replaced and the upholstery appears to be in very good condition throughout. The stand alone galley is well equipped and spacious, the heads compartment has the benefit of a shower and there are twin grey and black water holding tanks fitted. The comfortable internal helm position has good visibility all round, electronic engine controls and an extensive navigation fit. The flybridge is also well fitted with instrumentation & controls. The electric windlass can be controlled from both positions. The huge walk around engine room makes it very easy to work on the engine, generator, inverter and other mechanical and electrical systems. It also has the scope to provide more storage or possibly further accommodation. 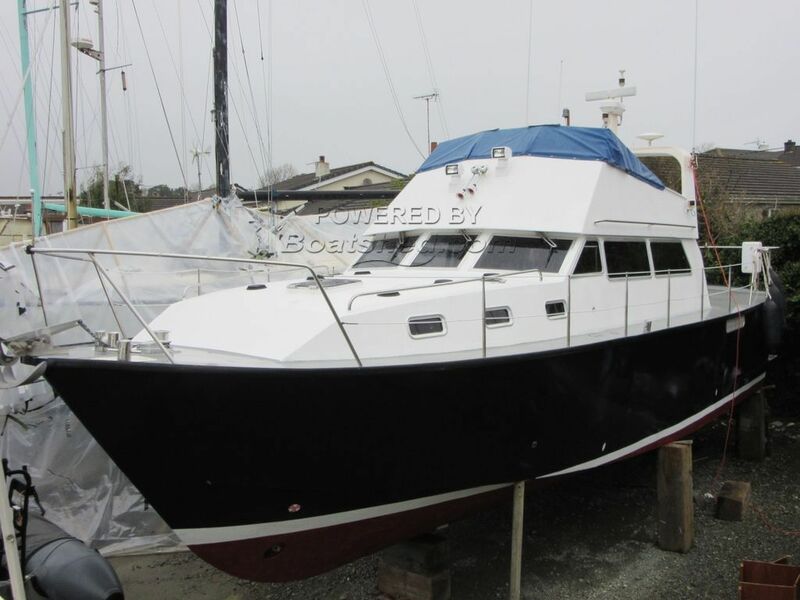 If you're looking for a spacious mobile live aboard, this vessel is well worth a look. Reason for sale: the owner plans to purchase a campervan on the sale of the vessel. This Steel Boat Bruce Roberts 342 MkII Waverunner has been personally photographed and viewed by Billy & Jo Hallam of Boatshed Plymouth. Click here for contact details.